Flatworms attach and release rapidly on most surfaces. The adhesive organs are composed of three cell types – an adhesive gland cell, a releasing gland cell, and an anchor cell for structural stabilization. In the present project we aim identifying novel proteins that are involved in biological adhesion and release in 20 diverse flatworm species. The species are carefully selected to cover the major taxa of the Platyhelminthes and encompasses species from marine, brackish, and freshwater habitats and a parasitic species. 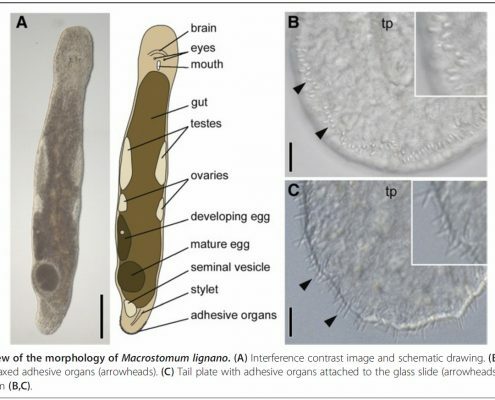 We hypothesize that flatworms have evolved adaptations to meet the requirements for adhesion in the respective environment since an adhesive protein we identified in the flatworm Macrostomum lignano does not show any homologs in a transcriptomes of 61 other flatworm species. We will apply a toolbox including transcriptome sequencing, differential gene expression, Mass Spectrometry, In situ hybridization screening, Lectin staining and Lectin pull-down, specific antibodies, and light – and electron microscopy to study flatworm adhesion. The Action member Sophie Greistorfer and her supervisor Janek von Byern received a PhD scholarship at the Austrian Academy of Sciences. 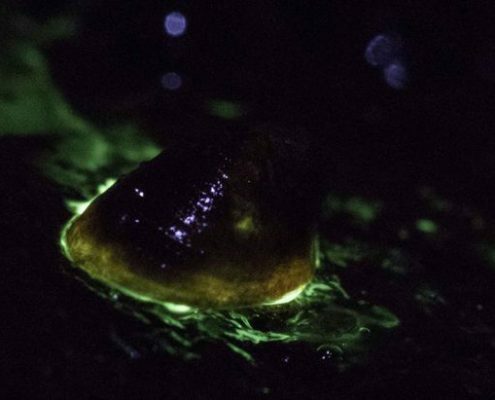 In this project the PhD candidate Sophie will perform a detailed characterisation of the luminescent mucus of Latia neritoides. 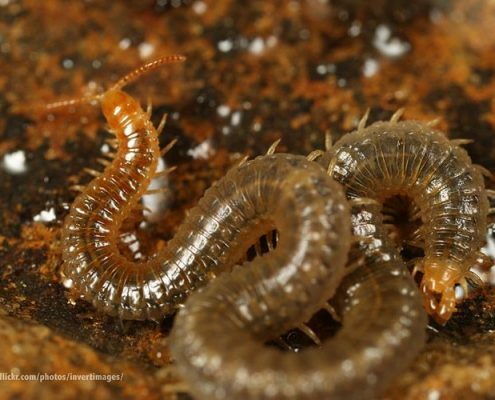 Since no biochemical and transcriptomic analyses have been undertaken on this species, this approach will give first insights in its gene expression as well as shed light on the chemical composition of the defence glue. In this project also the member Peter Ladurner (MC Austria) and the IPC member Benno Meyer-Rochow (Japan) is involved. This study is focussed on the characterization of the temporary adhesion in sea stars, in order to provide a new reversible adhesive system for biomimetic approaches. Temporary adhesion in sea stars is based on a duo-gland adhesive system, where adhesive glands secrete the proteinaceous glue and a different gland type produces a de-adhesive substance. We investigate the adhesive and de-adhesive proteins, carbohydrate moieties, and foot print properties of the sea star Asterina gibbosa. 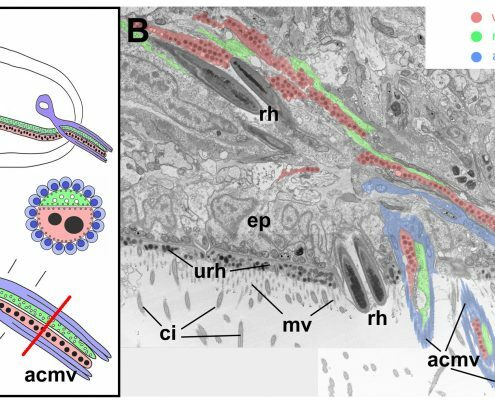 In the past 20 years, significant advances have been made towards understanding adhesion in very few select organisms, e.g. marine mussels. To harness the potential of natural adhesion systems for synthetic glues and non-stick surfaces, more organisms must be investigated and in a more systematic fashion. 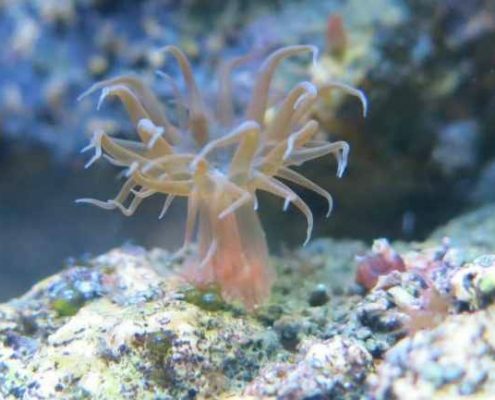 The aim here is to develop the anemone Aiptasia as a model for bioadhesion studies where its ancestral lineage and starkly different adhesion system (compared to e.g. mussels) will inform future fundamental studies of biological adhesion, develop new avenues for the design of synthetic adhesives and provide a valuable resource for the wider community. The data collected will also underpin evolutionary studies of adhesion and inform the development of non-fouling surfaces to which anemones cannot stick.